It may only be early October, but early October turns into late October before we know it - and then we are at Christmas. So lets take some time and enjoy what Halloween has to offer. I'm quite excited for my pumpkin carving party this year. Already scoping out recipes to cook, designs to carve, and decorations to hang. So I thought I'd share some of my fixation with all of you. Carving a pumpkin is always fun. You don't even have to be super good to get a creative pumpkin. Look at this Mouse Hotel design from Martha Stewart. 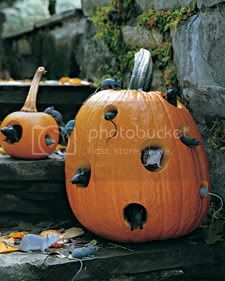 You just clean out the pumpkin and cut some holes out of it that you fill with plastic mice. And it's kinda freaky. I mean imagine it with a candle in it. The gray pumpkins are so smooth and pretty and with the scraping technique you can really get some good glow action. I've yet to actually try it yet - but maybe this year. Decorating is also fun - and while most of my decorations are from Target or William Glen - Etsy.com has some great stuff as well. I love this print done on a book page - from Ephemera and More. 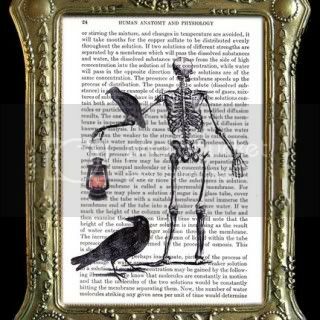 Crows and skeletons on an anatomy book page is great... but this frame makes it. 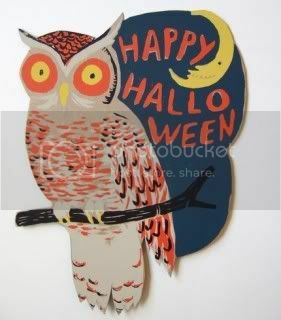 Or go vintage with the great Halloween Owl. Possibly my favorite find on Etsy - as I am sure you can imagine. Of course you can always find good crafty activities as well. 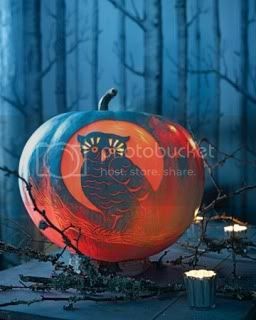 One Pretty Thing is a great site that does Halloween Craft Roundups if you need some ideas. Hope you have a spooky halloween! I'm a west-coast mama of two little ones, 15 months apart. This is our family story with reviews and recommendations along the way. Thanks for joining our journey. Why all the changes at one year? Travel Advice from Families that Travel. When the Year of "Yes" Turns into the Year of "What the..."